McMurtry’s father is a novelist and his mother an English professor. So, he decided to join the family business and become a musician. I’m only half kidding when I say this, but it is easy to see where McMurtry gets his songwriting inspiration from. As one of the best songwriters around, it was actually the guitar that took a little bit of getting used to. He says that he learned everything either by ear or by watching other people. Whatever he did, I’d say it worked. With that said, it did not just happen overnight for McMurtry. He worked as a painter and bartender, performing at open mics when the opportunities presented themselves. When he won the small-town Kerrville Folk Festival New Folk songwriter contest, he caught the eye of John Mellencamp. All of the books and time spent teaching himself the guitar would soon pay off. McMurtry always had a voice and now he had a chance to put it on full display. He’s now released twelve albums in the last twenty-five years. His commentary is always evolving and each of his albums sends a different message. In 2005, his album Childish Things and the title track took home both Americana album and song of the year, respectively. His smooth, methodical style at times resembles a conversation had between friends more than anything else. The sweetness of his country twang hits you in just the right place and blends perfectly with his slow strumming guitar. McMurtry always doles out exactly what you need, and you might even learn a thing or two along the way. Early on, Hart says he learned to, “appreciate MUSIC for what it was….not because it was this or that genre. I have a great disdain for genre segregation. I try to avoid that practice.” I’m glad we both agree on that. This most likely stems from Hart and his family never being rooted in one place. Born in California, Hart also spent many years of his childhood in the Midwest and in Mississippi. He picked up on the styles and sounds that he liked and forgot about those that he didn’t. Soon, there was an idea, a dream. Instead of playing Pong, Asteroids, or Galaxian, Hart played the guitar. He knew what he wanted to play, how he wanted to play it, and quickly became one of the most formidable country blues musicians around. Naturally, I did exactly what I said I didn’t like and classified Hart as a genre artist. This is far from the case. Go get tickets now while there are still some under $30. I’m still convinced Billy Gibbons and Dusty Hill trade places with each other when they feel like messing with the audience. Thankfully, Frank Beard kept it simple or else we’d really be lost. If you know ZZ Top, you know exactly what I’m talking about. If you don’t, that’s all the more reason to go see them. The American rock group has been tearing up stages since 1970. One of the most authentic rock groups of any time period, ZZ Top is deeply rooted in blues. Their name is a tribute to blues legend B.B. King, who was at the “top” of the blues world. ZZ Top took their blues influences and turned it into a genuine rock backed on Gibbons’ guitar prowess. In addition to their musical mastery, they are known for having some of the best, most clever lyrics. You’ll undoubtedly catch one of their many double entendres in any of their top songs. I would argue they have one of the best, unique sounds of any rock group. As Michael “Cub” Koda described, “As genuine roots musicians, they have few peers.” Few have also reached the success that the trio has. 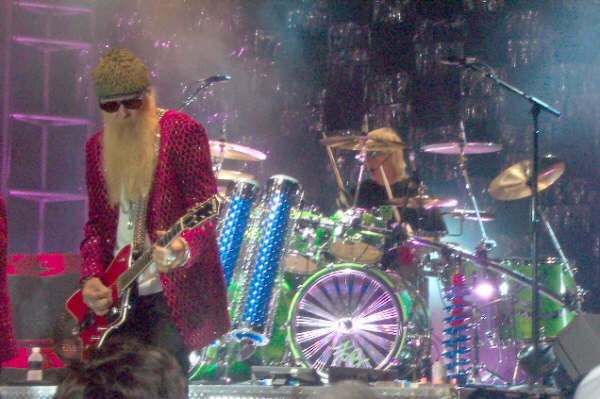 ZZ Top has eleven gold, seven platinum, and three multi-platinum albums. On top of that, they won award after award in the 1980s for their music videos and were inducted into the Rock and Roll Hall of Fame in 2004. To me, the biggest honor was from the Texas House of Representatives, who deemed the Houston group “Official Heroes of the State of Texas.” It’ll be a sad day in music when they decide to stop playing or if they shave their beards. Thankfully, these guys are rocking just as hard as ever, and they still have their iconic look.